The present Eydon Players is by no means the first amateur dramatic society in the village. There are various groups mentioned in the history of the village hall, the last being Eydon Players in 1974. After several successful productions, this group disbanded. A new group of enthusiasts put on the pantomime, Robinson Crusoe, in 1989. Fired by their success, they founded a new Eydon Players and set about raising funds. 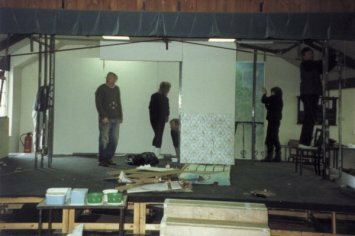 The first event was in September 1990, the fund-raising revue The Serpent Club, followed in December by the pantomime Red Riding Hood. Since then, the Players have continued to provide the village with plays, musicals and pantomimes. Follow the link to the Archives file for details. Built in 1926, the village hall is the home of the Eydon Players. 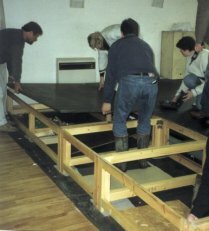 The stage is a temporary structure and has to be built from the floor up for every production. Fortunately, lighting grid, bars and wiring can be left in place. Seating capacity for performances is limited to 75. Membership of the Players is open to anyone over the age of seven. Our members mostly come from Eydon itself and the surrounding villages. Numbers vary from year to year, but hover around a total of fifty, some being children or teenagers. The management of Eydon Players rests with a Committee elected at the AGM, which is held in June. Officers of the committee are the Chairman, Treasurer and Secretary. The Treasurer and Secretary are elected at the AGM, but the Chairman and the membership and social secretaries are elected from within the committee. One of the main responsibilities of the Committee is to decide future productions, approve the Director and appoint a Producer, who manages the individual project. The rest of the production team is put together by the producer. The budget for a production is worked out by the producer, but has to be approved by the Committee. In general, there are two productions each year, a play or musical in May and the pantomime in early December. At various times, the Players have put on an extra production, usually for one night; an example being the Victorian Music Hall evening. The Players have also participated in the Weedon Drama Festival of one act plays and toured a Murder Mystery entertainment in support of local villages' fund raising. Eydon Players earliest productions were the fund-raising evenings and the annual pantomime, with strong musical content. Progress was made into musicals, but it was four years before the society felt confident enough to tackle a play........all those words and no songs to help the show along. From then on, there was no stopping them. A glance at the Archives will show that the Players have made real use of the talents available to them. Productions such as The Importance of being Earnest, The Dresser and The Beggar's Opera could not have succeeded without a strong and talented cast. The Archives list a number of shows put on by Junior Players. There have always been children and young people involved in the Society, for amateur drama at Eydon is often a whole family activity. A pantomime is always chosen that will provide parts for the children and not just as members of the chorus. Some of the spring productions have also given opportunities to young people. Drama apart, the Eydon Players have supported village fetes and the 2002 and 2012 Jubilees by providing entertainment. Donations to children's charities are also made on a regular basis. There is also an active social side to the society. After rehearsals, there is often an extended "discussion session" at the local hostelry, the Royal Oak. A Garden Party is held in July and a barbeque in August..